There were 20 press releases posted in the last 24 hours and 153,129 in the last 365 days. TOKIO , JAPAN, April 5, 2019 /EINPresswire.com/ -- Platinum is developing the technology behind a new, more efficient stablecoin – the USDQ – that is set to launch in April this year and get all the features within a few months. 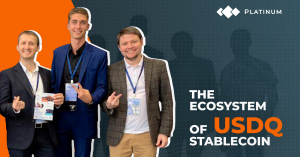 USDQ is a bitcoin-backed decentralized stablecoin whose value will be pegged against the US dollar at 1:1. USDQ aims to solve the problems with current stablecoins. Popular stablecoins like Tether are in the news for not being able to consistently back themselves with the US dollar and using other collateral investment instruments. However, this will only lead to further price fluctuations that will work against the very concept of a stablecoin. By creating a robust system to control the transactions surrounding the USDQ, its price will always remain relatively stable and will not be swayed by market forces. It will thus create a true stablecoin. Once the USDQ lists on crypto exchanges, there will be two options for traders to buy it – one from the website, by placing a collateral of bitcoin or other cryptocurrencies (in future) or from the secondary markets, i.e., the exchanges. The smart contract governing the USDQ is programmed in such a way that when new amount of cryptocurrency enters the ecosystem, new USDQ are “printed” and sent to the borrower. When the borrower wishes to return the credit and take back the collateral, the funds are “de-frozen,” returned to the user’s wallet and the received USDQ are burned. This system will ensure that no more than the required USDQ remain within the system and its price remains stable against the US dollar. A scanner service will provide a high level of transparency and users will be able to view every single transaction to ensure that funds received as collateral is not used but is kept in safe storage in the asset control system whose private keys are stored in a separate storage. There will be no human intervention in these decision making processes, leading to a high level of decentralization. The tech development of USDQ follows a strict timeline. During April - May 2019, the standard smart contract of USDQ, backed by bitcoin will be released. A clean, clutter-free website will be created that will monitor collateral and released assets and will also describe the concept of USDQ. Towards July - August 2019, beta inauguration of loan interface. A closed test for whitelisted users will occur and first loans secured by users’ bitcoins in semi-automatic mode will be given out. Listing of USDQ will take place on the world’s top exchanges and the first USDQ tokens will thus be released in the secondary market. Loans will be processed manually. During November - December 2019, the first public beta will be released. The loan process will be completely automated, voting system will be implemented and there will be a limited launch of predictor robots within the team of the project. Managing tokens will also be released. January - February 2020 will witness the release of the first public predictor robots. The mining process starts. Finally, in March - April 2020, Automation of the loan process of JPYQ, KRWQ, CNYQ tokens will begin. The technology that will power the USDQ has been created by Platinum, the global leader in blockchain technology and the largest listing brokers for ICO/STO/IEO. They provide a wide range of services – from technical support like programming (blockchain development, token creation, smart contracts, IT support, etc.) and to comprehensive legal advisory. “The USDQ is a special project that we are all proud of. By creating a mechanism to buy USDQ on the website by placing a bitcoin collateral, we have created a system wherein the USDQ is not left at the mercy of speculative market forces. Prices are adjusted in real time thus we get a true stablecoin whose value always remains close to that of a US dollar,” said a Platinum team official. During the September launch of USDQ, it will be listed on the top crypto exchanges. To know more on what USDQ is and how it works, read the special page. For more information on the comprehensive list of services offered by Platinum, please visit https://platinum.fund.